You can stock all the snacks, booze, and girls-kissing-girls you want, but if your guests hate your iPod playlist, the party will come to a screeching halt, and they'll quickly forget how much they loved those hot, big-breasted snickerdoodles. 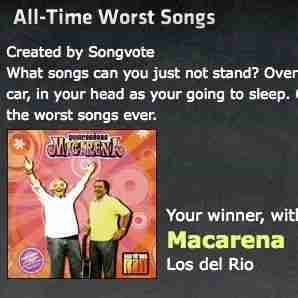 Give everyone a say on what'll play, with SongVote.com. Now ramping up from Uptown, SongVote's a polling service that allows groups to submit and vote on event soundtracks; the idea came from one of the co-founders, an ex-IBMer whose pool parties were marred by pals yanking others' iPods and replacing them with their own -- immaturity that really put a damper on Hawaiian Punch-fueled chicken fights. A simple sign-up lets you create "contests" comprised of songs you've suggested, which you then invite others via email/Facebook to vote/comment on, plus submit their own tune ideas; most of the album-art'd nominees are displayed alongside clip-providing play buttons and links to buy, so once the contest ends any song not already owned can be quickly gotten, or, if you're Ahmadinejad, ignored, and its supporters thrown in jail. For outside help, you can make your contests public for any SongVote member to chime in on; if you have no parties to attend, just vote on others' virtually-open bashes, or on SongVote-sponsored playlists like Road-Trip Songs (Whitesnake's "Here I Go Again"...Beyonce's "If I Were a Boy"? ), and Songs to Clean House To, which hilariously for your girlfriend includes Rob Base's "It Takes Two". 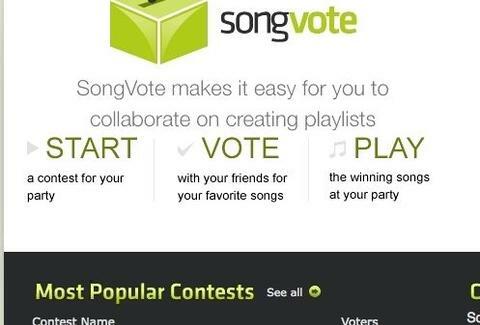 By summer, SongVote plans all sorts of open and semi-open vote-stravaganzas: top-100 singles lists from each of the last 15 years, bar/resto-sponsored contests for happy-hour regulars, and polls to determine the next song that YouTube-notorious musicians will lend their vocal stylings to -- so when Tay Zonday covers "November Rain", the entire party will be left lustily, sweatily snicker-doodling.